The oldest island in the Hawaiian archipelago, and known as the garden island, Kauai boasts landforms and ecosystems ranging from mountains to beaches, volcanoes, jungle, beach resorts, tropical flora, and fauna, to spectacular hiking and cycling trails. 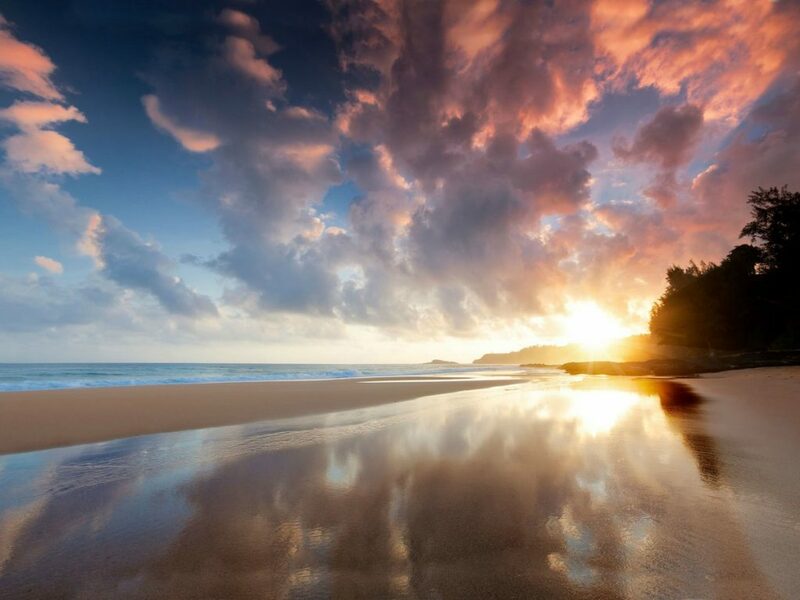 Over half of Kauai’s coastline is white sandy beach, of which you can view awe-inspiring sunrises and sunsets that will melt away your worries. Not population-dense in the slightest, this island has a total population reaching under one hundred thousand, carrying with it an affluent geological history that has not been forgotten. Out of all of the Hawaiian islands, this one has the most beaches. 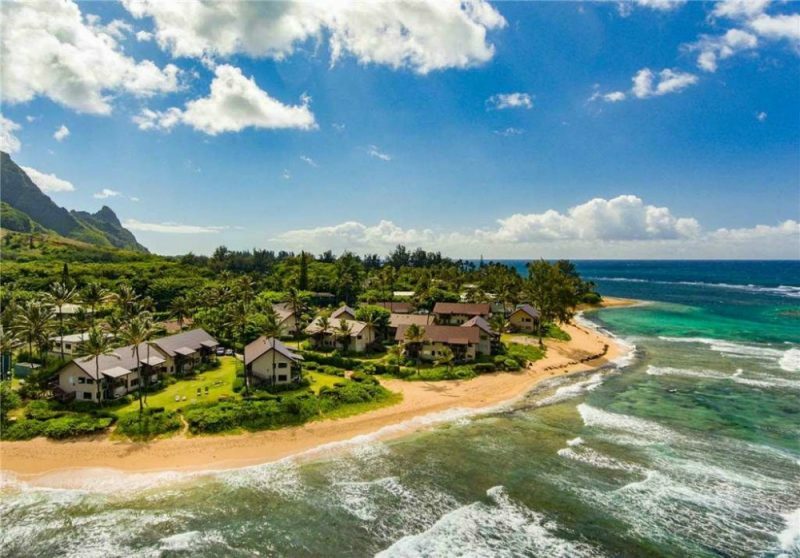 Whether you are searching for a tranquil waterfront or one with crashing waves, a white sand or a black sand beach, or whether you want to travel to an isolated beach by helicopter or visit a touristy one with every amenity you can think of, Kauai has an option for every sort of beach goer. Chances are if you are planning a trip to Kauai, you’re going to spending a number of days at the beach. So, check out this list of gorgeous and top-rated beaches in the land of Aloha and Mahalo. Visited by Hawaiians for generations, this reddish-gold sand beach, Salt Pond Beach, is an ideal vacation spot for the family. The only place on the island where traditional Hawaiian salt collecting ponds still exist. At the Southern point of the beach, the salt ponds fill with sea water and then evaporate. After, the resulting rock crystals are ready to be harvested and used for cooking, or soothing mineral baths. Near the salt ponds is an excellent place for snorkeling, where you can surely spot unique fish species such as butterfly fish, unicorn fish, or goatfish. Make sure to bring your underwater camera! The best times for snorkeling here are during the Winter months, but of course, you can choose to do this activity at any time of the year. This beach park is protected by a reef that barricades the rugged currents, so rest assured that you won’t get swept away by any waves. Just keep in mind that the rip currents can come in during times of high surf. There is a small lagoon in Salt Pond Beach Park that’s been formed by a natural rock ridge, which is refreshing to spend the day in and for relaxing in the waters. It’s also deemed a safe area for your toddler to swim in. Overall, this is a great ‘family beach,’ featuring calm waters more often than not. A secluded beach on the West side of Kauai, Polihale State Park Beach is able to be accessed via a five mile dirt road and is a sort of mini-Sahara, but tropical. Upon arrival to this beautiful beach, you’ll see large sand dunes, some of which measure in at over one hundred feet tall. If you want to go swimming, it’s recommended to do so at Queens Pond, as it’s protected from strong currents. For those of you that like to go camping, this is a special beach to pitch your tent on. If you do decide to camp, a permit is required. You’ll have to test the sand to see if it’s cool enough to go barefoot, as it can sometimes feel hotter than lava underneath your toes. At the Northern end of Polihale, you’ll see tall cliffs that establish the beginning of the Na Pali coast and divide the North and West sides of the island. Hawaiians regard these cliffs as the location where the souls of the deceased would embark on their journey to the Underworld. Within this state park, you may come across some ancient temples and burial sites if you decide to go on any hiking adventures. One of the top beaches on Kauai, the white sands of Kekaha Beach are a sight to see. You can find this beach park on the Kaumualii Highway, which is on the Southwestern shore of the island. This fifteen mile long beach features the longest stretch of white sand in the state of Hawaii. The weather here is typically sunny, but strong winds are known to roll through, so hold on tight to your sarong! Also, there’s not a whole lot of shade on this beach, so you might consider bringing an umbrella. You might choose to sunbathe, boogie board, or surf, and you can even have a beach wedding here if you’re ready to take your love relationship to the next level. This Kauai beach is not protected from the open ocean, so expect strong currents, shore breaks and riptides to surface. It’s best to avoid swimming when the surf is up, unless you like to live life on the edge. If you find your tummy growling, there are barbeque areas and places to clean your fish, if you want to grill some up. Kimsey Beach House, a beach house Kauai offers that is smack dab in front of the beach, with a sleeping sunroom, skylights, a master suite, and a modern kitchen with ceiling fans to cool ya’ off, is an option for those of you that want to go “all out.” If you’re having a family reunion or a celebration of sorts, this home can accommodate up to fifteen people. The last beach that’s accessible by car on the North Shore, Kee Beach is one of the beaches in Kauai that is considered to be at “the end of the road,” because it’s the farthest you can drive on this part of the island. If you arrive during Summertime, you’ll almost always find calm water conditions. At any point in the year, you can experience breathtaking sunsets, with a view of the entire Na Pali coast. As far as beach activities are concerned, you’ll find great snorkeling opportunities – note that the consistency of what lies beneath the water is a combination of coral reef and sand. Tread lightly so as to not get cut by any sharp coral. Fishing, scuba diving, and hiking are all activities you can do together as a family. 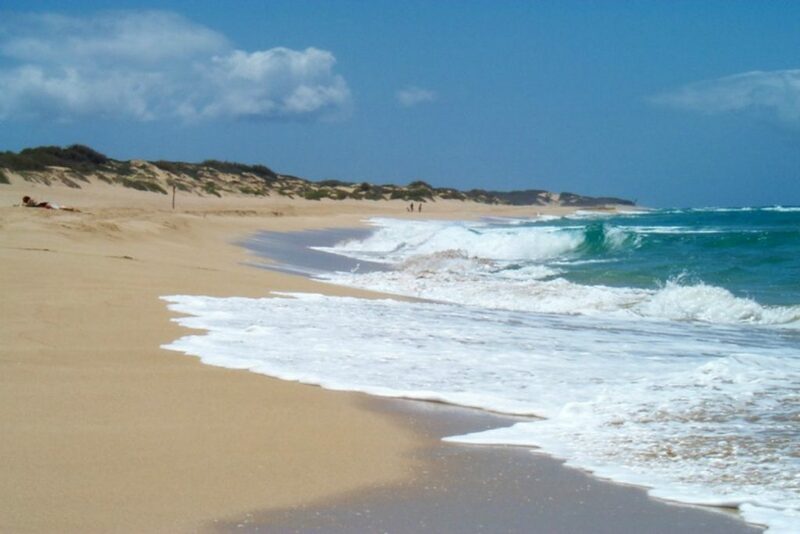 You might also choose to simply walk along the beach and enjoy the awe-inspiring landscape. Also, there is a lifeguard on duty for the occasional riptides that surface. Kee Beach is one of Kauai’s more popular beaches, so if you’re trying to have some private time with your mate, then consider going early in the morning to catch the sunrise, or later in the evening. There are public bathrooms and showers available for use, too. The infamously beautiful Kalalau trail begins here at Kee Beach. 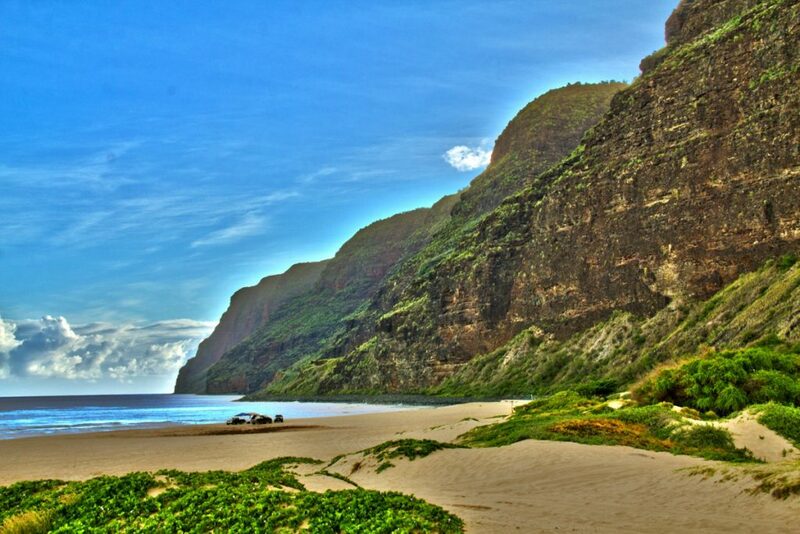 After the first two miles of the hike, you’ll find yourself at Hanakapi’ai Beach, and the last nine miles of the trek will land you at Kalalau Valley. It’s not a bad idea to start the hike early, as the beaming sun becomes more intense throughout the day. One of the best beaches on the Kauai north shore, Lumahai Beach is perfect for you daredevils, as the currents that surface are out of this world! Envision lava cliffs with vegetation growing on them in the background, and wafts of fresh ocean air. The sand slope does generate a strong undertow in addition to powerful waves that break right onto the thick white sand. The might behind these currents can be tremendous, so you might want to place a leash on your baby – just kidding! This North Shore beach is fairly wide, and directly connects to the ocean – the Eastern side is protected by a natural rock barricade that provides a level of protection and shelters you from incoming waves. You might decide to go swimming, bodyboarding, or take those family photos you’ve been procrastinating on while you still have that glowing skin. This beach is also a fantastic one to go running or walking on, as the soft sand between your toes can feel quite glorious. For those that surf, it’s recommended that only those at the expert level take on these killer waves. Some have commented that this is the most aesthetically pleasing beach on the island. You’ll just have to see for yourself and determine if you feel the same. This lovely beach has a two mile fringed reef that runs parallel to the shoreline and being one of the best beaches in Kauai, Anini Beach is known for its tranquility. A quiet beach, this one is an ideal locale for a romantic sunset dinner in the sand, as the beachgoers tend to thin out around this time of day. If you like to spend as much time in the great outdoors as possible, there is a campground facility available. Windsurfing is a very popular hobby among both tourists and Hawaiians. If you aren’t familiar with this activity – lessons are offered here. For those of you that perhaps decide to take a stroll, you’ll see some pristine oceanfront vacation rental homes lining the shore. You might catch a glimpse of some of the locals going about their daily chores like harvesting seaweed, or spearfishing a potential dinner. In Winter, the current can pick up the ‘G-force,’ so to speak, and unexpectedly come crashing in. So keep those eyeballs open! 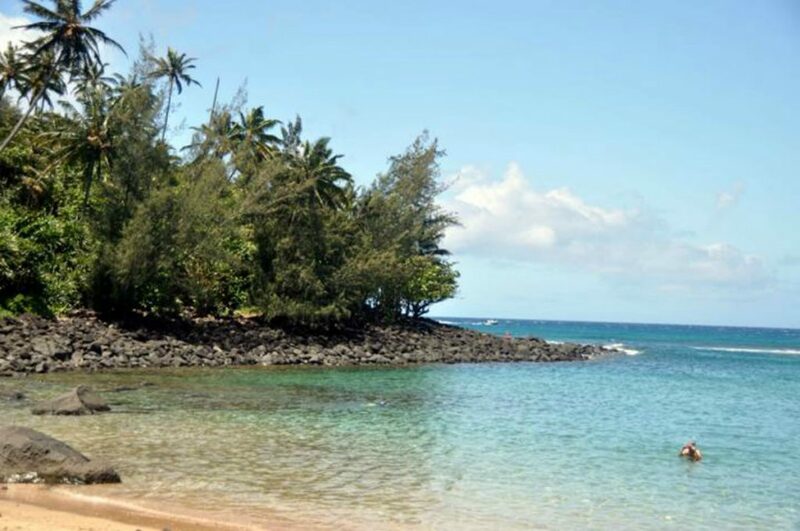 This treasure cove that was discovered in 1778 by Captain James Cook, Kalapaki Beach is known for being the first spot on the island to establish a Kauai Beach resort. The majority of the time the waves are gentle as can be at this prime beach paradise, which makes for excellent swimming and paddleboarding opportunities. It’s one of the best Kauai beaches for swimming. If you’re planning on spending the entire day outside, there are fortunate shady patches on this beach if you’re concerned about overexposure to the sun. You might elect to play beach volleyball, go on an exotic kayaking tour, board a catamaran cruise, or go sailing (Kalapaki is the only place on the island where you can rent a sailboat). You can also rent beach equipment, or you can choose to spend the day laying on your beach towel soaking up the sunshine, doing absolutely nothing at all. Everyone’s definition of vacation is different, right? If you want to steer away from aquatic activities, try out ziplining for an adrenaline rush, participate in a land tour, buy some souvenirs at the local boutique shops, or spend the day golfing at Kauai Lagoons Championship Golf Course. There are cute, quaint hotels and other accommodations that are reasonably priced on this island. As far as how things are looking underwater, you’ll encounter a mixture of sand and coral reef. It’s not too sharp to walk on, but it never hurts to bring water shoes. If you’re looking to snorkel and see unique fish species, venture to the Eastern side of the cliffs on Kalapaki Beach, as this is where you’re likely to see them. 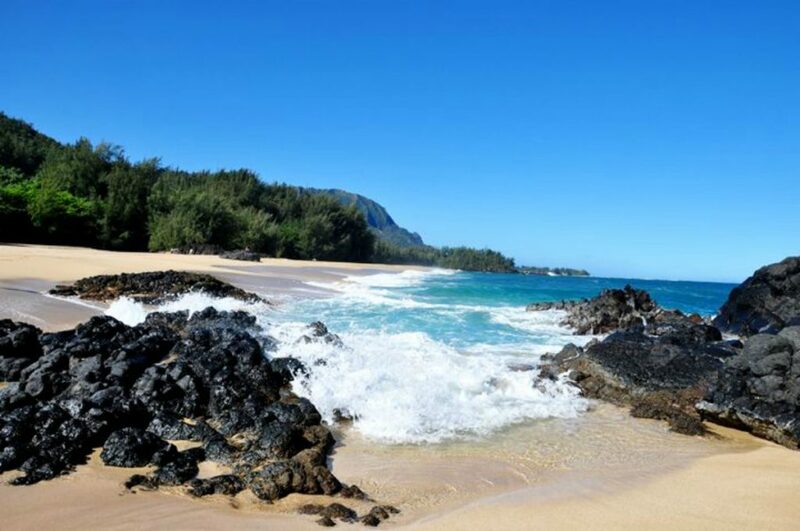 This beach is located about three miles and a whopping five minutes from Lihue airport. 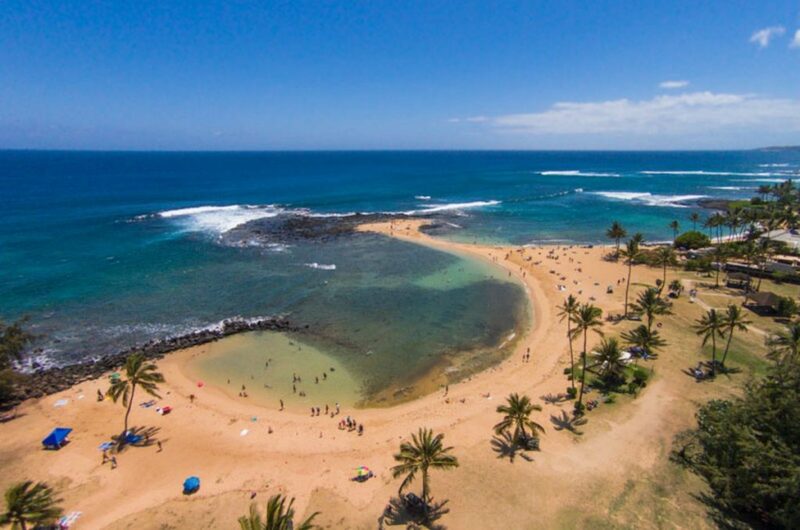 One of Kauai’s best beaches, and well-traversed by natives and foreigners alike, Poipu Beach is able to be pinpointed on the South Shore of the island. You’ll be able to identify it by its series of golden-sand crescents seemingly all lined up in a row. The Eastern side is distinct from the Western side in that it is kid-friendly, due to the calm waves and the water being only a couple of inches deep. 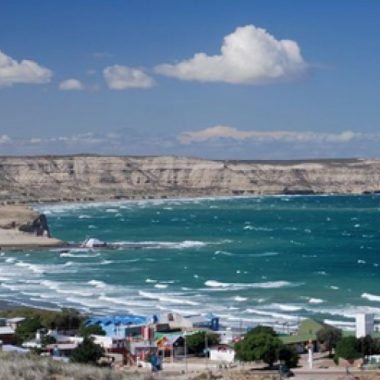 On the Western side, sometimes known as Shipwreck Beach, the waves do break and you’ll encounter stronger currents that make pole fishing (fishing where you use a pole instead of the traditional rod), windsurfing, and surfing all enjoyable activities to pass the day. It also has the best snorkeling too, and swimmers are likely to see some snippets of marine life like eel, goatfish, orange band surgeonfish, Whitespotted Sea Cucumber, or turtles floating around. Snorkelers might get a kick out of Tunnels Beach too – another popular snorkeling haunt. It’s wise to remember that weather conditions are as unique as the beaches in Kauai themselves. Weather is unpredictable, so keep your eyes on the water every so often, as the wave intensity can change in a moment’s notice. When you start to feel hungry, there are barbecues available for public use, or you can choose to grub at a variety of restaurants in town. There are also drinking water facilities available on the beach – swimming in that salty sea water can sure make ya’ thirsty! The Travel Channel has deemed this one of the world’s best beaches, however, it does not get nearly as crowded as, say, Waikiki Beach on Oahu. If you’re lucky, maybe you’ll see some Hawaiian Monk seals (a now endangered species) basking in the sun. If you would like to photograph them, be mindful and turn off your camera’s flash, as it might startle them. From December to April, you may be able to spot Humpback whales in the distance here at Poipu Beach. If you need to run to the loo, there are restrooms, as well as showers to rinse off all of the fun you’ve been having. And, if you decide to drive into this beach park, there is a parking lot for your set of wheels. 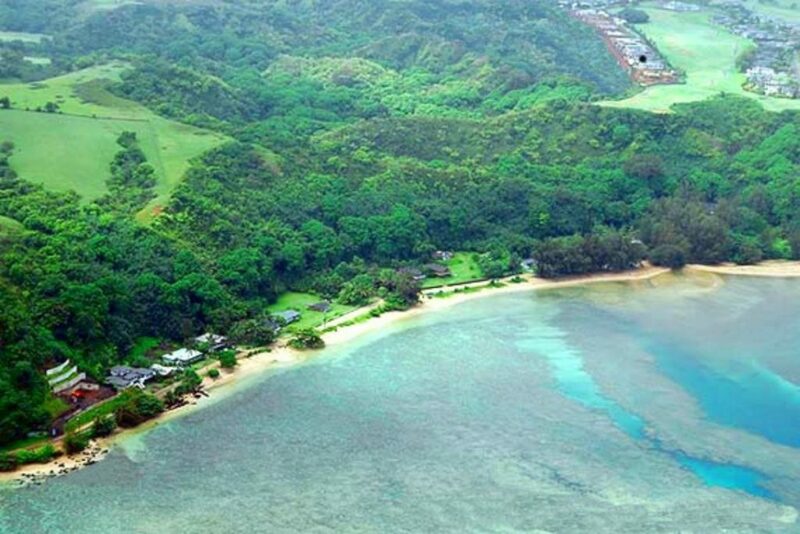 Hanalei Bay Beach is a great choice for the family. This is a truly pristine nook in the world, with over two miles of sandy shoreline on this crescent-shaped, clear-water beach. You’ll notice lush, green mountains in the background and see that this beach is bordered by the Hanelei River in the East and the Waipa River to the West, where beginning surfers lessons are often held. There are two impressive and colorful coral reefs on either side of this beach area. If you’re interested in surfing some stellar waves, the reef on the right is perfect for surfers – inhabitants of neighboring islands travel here just for the waves. Riding the waves early in the morning is a tradition for many residents on this North shore. If you are a beginner surfer and would prefer a gentler wave, you’ll find that closer to the pier. 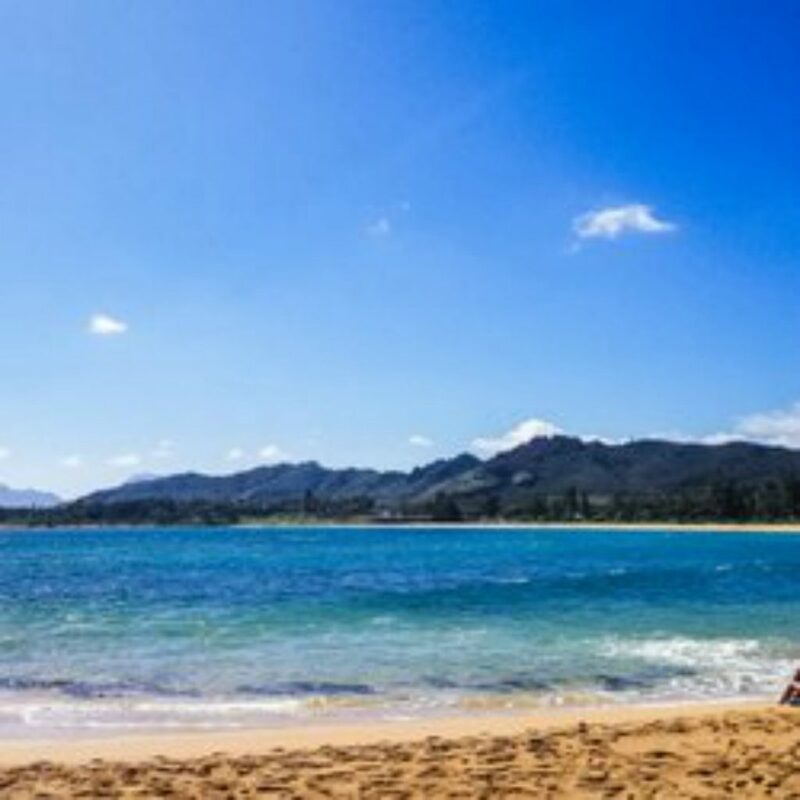 Hanalei Bay Beach is perfect for swimming at all times of the year, and if you get tired of swimming, you can try out some new activities such as boogie boarding, fishing, kayaking, boating, or paddling. If you like the idea of spending the night in a tent listening to the lulling ocean waves, camping is permitted on the weekends as well as holidays. If you or your children love to play in the sand, there are annual sandcastle building competitions in Hanalei. For those of you that adore marine life, it’s not too uncommon to see dolphins in the Summer months. 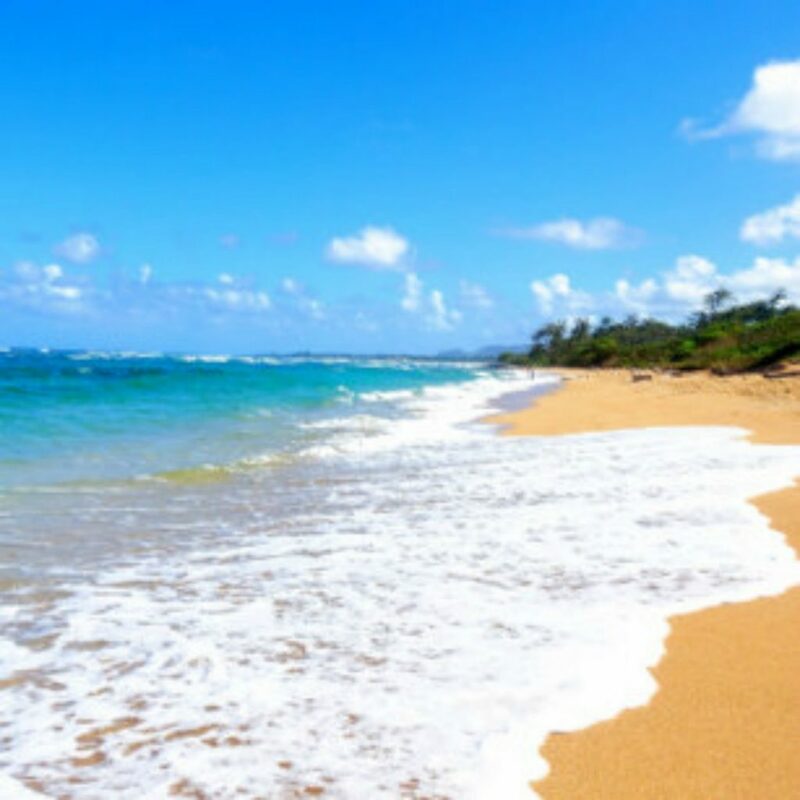 Considered one of the top beaches in Kauai, Lydgate Beach is located on the Eastern side of the island, and the variety of activities available for those of all ages makes this beach a ‘complete’ one. One of the beaches in Kauai where you can find lifeguards on duty, you can rest assured that there is likely an extra set of eyes on your child. Potential activities include swimming and snorkeling. It’s one of the best snorkeling beaches in Kauai thanks to the many lagoons and tranquil waters. 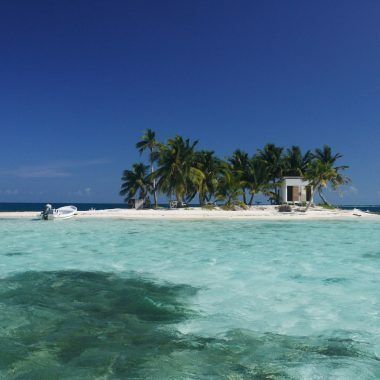 But if snorkeling isn’t you thing why not enjoy a beachfront picnic, or check out the two and a half mile long hiking trail (which is suitable for cyclists, too!). At the Northern end of the beach, a popular feature is the two different pools that are shielded from the ocean swells by big boulders. These are ideal for lounging around in if you want a break from the ocean, although some fish from the reef might swim over and say hello to you. The inner pool is the one that is shallower, and therefore, recommended for little ones to swim around in, while the outer pool is deeper, and ideal for those that want to snorkel in unperturbed waters, or just swim in. If you end up getting buried in the sand, there are showers to rinse off in, as well as restrooms. For those of you that might be interested in playing frisbee or flying a kite, walk over to the grassy area. Or, if you have a young tyke that is a playground fanatic, you’ll find a large playground nearby. One of the most beautiful beaches in Kauai, a highlight of visiting Lydgate Beach is that you won’t leave without having seen at least a handful of bright and unique fish species. Be aware of the coral on this beach, as it can be sharp. While Kauai beaches are generally very safe, it’s vital to remember that ocean conditions can change at the drop of a hat. One minute there may be wave after wave, while the next minute can be followed by total silence. If there are any signs posted, be sure to read them, as they may be cautioning against important weather conditions. Be wary of swimming in murky water, as you don’t know what might be lurking beneath. Also, don’t turn your back on the ocean, and avoid swimming during storms. Can you drink on Hawaiian beaches? According to the law of Hawaii, it’s illegal to have an open container of alcohol in any public area. If you are caught toting around an alcoholic beverage, be aware you will have to pay a fine of a few hundred dollars. Even if you’re drinking in your parked vehicle, it’s not permitted to consume any sort of alcoholic beverage. How will I get around the island without a vehicle? Kauai offers shuttles, various buses, taxis, or you can opt for renting your own car. You can always rent a bicycle for the day, too, or choose to walk if you plan on staying in a particular area. What should I pack on my trip to Kauai? The sun will likely be shining at all times, so pack some lightweight, warm clothing. Bring a lightweight jacket that’s waterproof, for the intermittent rains that can occur. If you plan to go hiking in the jungles, pack a pair of athletic shoes. It might be an idea to bring a pair of clothes that you would like to wear out for dinner if you plan on dining at a nice restaurant, but no need to bring your suit and tie. You can always buy a hat and a pair of flip-flops upon arrival. Which beaches have lifeguards on duty? You’ll see lifeguards at Poipu Beach, Lydgate, Hanalei Bay, Kee Beach, and Kekaha Beach, among others. The extra set of eyes that a lifeguard provides can promote a sense of ease to those that may be concerned about intense and unexpected waves, but it’s also important to be self-reliant. Which airport is the main one on the island? Lihue Airport (LIH) in Southeastern Lihue is the main airport on Kauai. You can choose to fly into Honolulu International Airport (HNL) and catch a connecting flight to Kauai. Most of the time airlines do offer direct flights to Kauai. How is the weather in Kauai? The weather is generally hot and humid year-round, with temperatures ranging between seventy-five and eighty degrees Fahrenheit. It tends to be the driest during Springtime and Fall when most tourists have returned home. The months of December to March is when the majority of tourists arrive, which is during Hawaii’s Winter. What are some activities I should do while I’m there? This depends on your interests! You might choose to visit the truly captivating Waimea canyon, hike the lush and green Napali coast, go snorkeling at Shipwreck Beach of Tunnels Beach, or do absolutely nothing. There are some stellar food options anywhere you go, and endless shops to visit. Whatever you spend your time doing, you won’t go wrong. Where might I find some good hiking trails on the island? Kokee State Park has over ten different trails that total over forty-five miles, and the Natural History Museum at this park has maps available for purchase, so you can have peace of mind that you’re on the right path. Also, on the South shore, you’ll find a captivating trail that leads to Mahaulepu Beach. If you would like to plan a coastal hike, check out the highly esteemed North Shore Kalalau trail. Am I able to camp on the island? If you’d like to camp at a state park, you’ll need a permit. You can even request them up to one year before arriving if you’re the type that likes to have all of your ducks in a row. For County parks, permits are granted for seven consecutive days in a row at your park of choice, however, you are able to camp for up to sixty days total at all of the County parks. In regards to state parks, the maximum number of nights you can stay at any chosen park is five. What is the currency in Kauai? The unit of currency is the United States Dollar (USD). So, if you are an American citizen, you’re already all set, however, if you are arriving from another country, you’ll need to exchange some money. How am I able to view the most up-to-date weather and ocean conditions? If you go to kauaiexplorer, you can find updated ocean reports and safety advice. On some beaches, you may find posted signs advising of weather conditions. Just pay attention to your surroundings and use your five senses at all times. The ocean conditions are known to change rapidly, so it’s always a good idea to keep your eyes on waters. Just remember, weather reports aren’t always accurate.